Abandonment of agricultural land is often happening all over the world and widespread in Russia. Such lands are subject to successional changes in vegetation and it seems necessary to provide effective methods for a sustainable ecosystem management of those lands. However, factors which determine successional processes, especially fires, have not been studied in detail. The aim of this article is to reveal how spring grass fires affect the abandoned arable lands in the study area at the landscape and local scales. A region of 265.5 km2 located in the south of Moscow was studied. At the landscape scale, we analyzed the spatial characteristics of the area in relation with a 30-year history of spring fire events extracted from the Landsat archive, and climatic data. Logistic regression was used. At the local scale, we sampled soil and vegetation at two sites and in three biotopes at each site: mature forest and two neighboring biotopes affected and unaffected by fire. Plant species diversity, soil quality, and relationship between soil and vegetation were assessed by ANOVA, v test, NMDS, and dbRDA. Abandoned lands covered 39% of the study area and not less than 72% of these were affected by grass fires, happening mainly between 1998 and 2014. Man causes the ignition of the field layer accidentally, but the area over which the fire spreads is determined by climatic factors and the presence of flammable material (dry grass and litter) for burning. High March temperatures and low precipitation values in April increase the inflammability of dry grasses which are abundant on the former fields. As a result, burnt areas are steadily expanding in abandoned lands where trees are scarce. On abandoned lands that were either affected or unaffected by fires, two different plant communities developed, respectively: grassy vegetation mainly dominated by Calamagrostis epigeios and young forest of pioneer trees with high crown coverage. Practically all soil variables were statistically different in three biotopes at the research sites. Plant species composition was best explained by six soil variables: P2O5, C/N, pH, K, SOC, and N values. We showed the key role of grass fires in the formation of differences in soil and vegetation during the successional recovery of abandoned lands at the local and landscape scales. 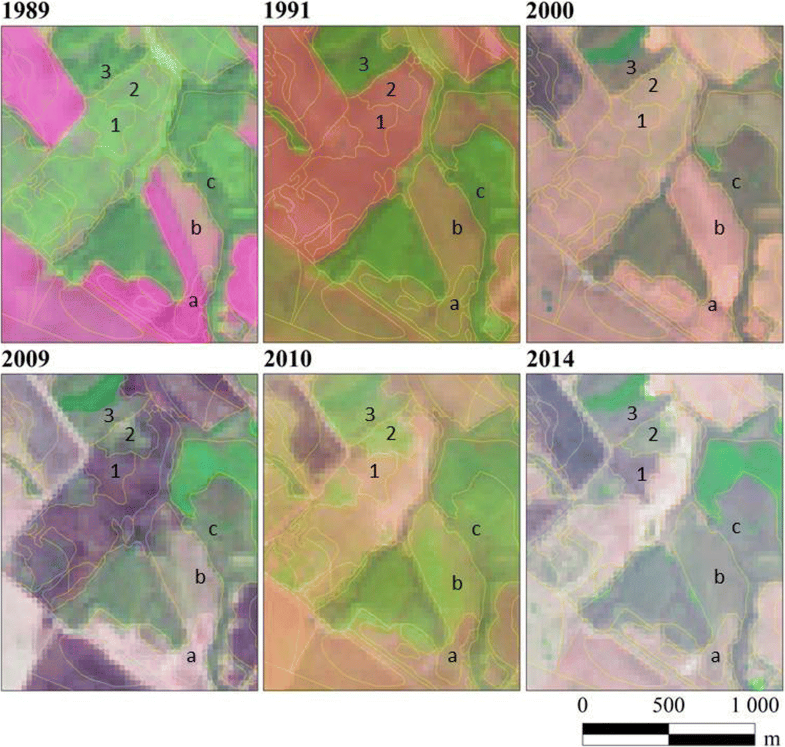 The world is experiencing a growing abandonment process of previously intensively managed agricultural lands (Baldock et al. 1996; Silver et al. 2000; Dunjó et al. 2003; Benayas et al. 2007; Bergen et al. 2008; Zhang et al. 2010a, 2010b; Prishchepov et al. 2012; Alcantara et al. 2013; Hansen et al. 2013; Margono et al. 2014). Many investigations have been devoted to the dynamics of soil and vegetation on abandoned lands, features of the spatial structure of their vegetation, changes in their biodiversity, in carbon and nitrogen budgets, and to peculiarities of carbon sequestration at different stages of forest recovery (Gough and Marrs 1990; Silver et al. 2000; Baniya et al. 2009; Tokavchuk 2010; Zhang et al. 2010a; De Frenne et al. 2011; Heikkinen et al. 2014; Hou and Fu 2014; Kurganova et al. 2014; Nyawira et al. 2016; Arévalo et al. 2017; Baeva et al. 2017; Telesnina et al. 2017; Kalinina et al. 2018). The area and proportion of abandoned lands in the Russian Federation, especially in its European part, are really huge (Lyuri et al. 2010; Kurganova et al. 2014; Potapov et al. 2015). Lands were massively abandoned in the late 1980s—early 1990s due to socio-economic and institutional changes that occurred in the country after the collapse of the Soviet Union. Between 1990 and 2007, 45.5 million ha of agricultural lands were abandoned over entire Russia of which 32.6 million ha in its European part (Lyuri et al. 2010; Kurganova et al. 2014). The situation varies across regions: in the Yaroslavl region lands removed from agricultural usage account for 418 thousand ha (43% of the total area of agricultural lands in the region before the collapse of the Soviet Union; Gulbe 2009); and in the Smolensk, Kaluga, Ryazan, Vladimir, and Tula regions such lands account for 46, 30, 28, 27, and 26%, respectively (altogether 1.7 million ha; Prishchepov et al. 2013); in the Leningrad and Sverdlovsk regions, these values are 90 and 14% (632 and 660 thousand ha, respectively; Novoselova et al. 2016). In European Russia, lands are more likely to be abandoned if they are situated further away from populated localities and market centers, or lie at forest edges or within forest tracts; furthermore, a higher likelihood of agricultural land abandonment is found to be significantly correlated with lower average grain yields in the late 1980s (Prishchepov et al. 2013). The specific conditions of these abandoned lands, such as their spatial parameters, soil characteristics, soil seed banks, neighboring plant communities, the type of previous farming, external impacts, etc., are rather diverse (Lyuri et al. 2010). It has been shown that all these parameters, in various combinations, define the trajectories of vegetation succession and features of vegetation recovery on the abandoned lands (Baniya et al. 2009; Baeten et al. 2010; De Frenne et al. 2011; Munroe et al. 2013; Hou et al. 2014; Plieninger et al. 2014; Kou et al. 2016; Stuble et al. 2017). For Central European Russia, it was shown that pioneer trees, such as European white birch (Betula pendula), gray alder (Alnus incana), or goat willow (Salix caprea), can settle on abandoned arable lands within the first 2 years, and in very high densities (Utkin et al. 2002, 2005). Intensive natural thinning of such stands occurs especially between 4 to 10 years of age while the density of the stands remains relatively high: up to 110,000 ind/ha were counted in 5-year-old Alnus incana stands (Gulbe 2012) and up to 66,000 ind/ha in 10-year-old Betula pendula stands (Gulbe 2009). 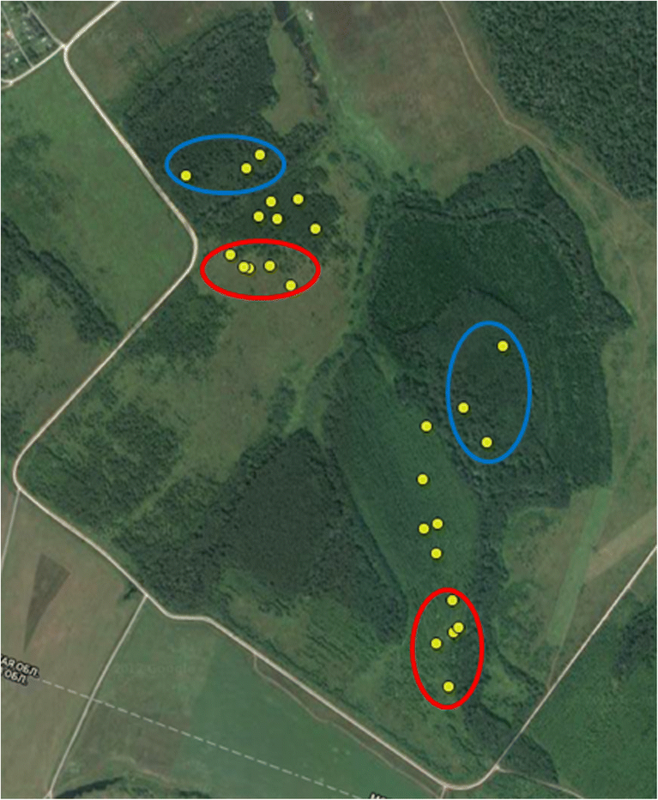 Further, 30-year-old Betula pendula forest developed on formerly plowed fields located within an old-growth multi-species broad-laved forest in the Kaluzhskie zaseki Reserve held between 500 to 1725 ind/ha in the overstorey (Smirnova et al. 2017). In this 30-year-old birch forest, in a 100-m-wide zone along the old-growth forest margin, shade-tolerant trees predominated in the understory: the total number of tree individuals varied from 20,558 to 83,314 ind/ha; European ash (Fraxinus excelsior) and Norway maple (Acer platanoides) dominated. European aspen (Populus tremula), Scots pine (Pinus sylvestris), and Norway spruce (Picea abies), as well as birch and goat willow, also occurred in former fields located in the middle and south taiga (Novoselova et al. 2016). Spontaneous regrowth of forest vegetation occurs even in the fields that have been in agricultural use for a long period of time (up to several centuries and longer) (Utkin et al. 2002, 2005). However, as many researchers have noted, the density of the undergrowth in the regenerating forest vegetation on former arable lands varies greatly within the same climatic conditions and sometimes there are no trees at all (Utkin et al. 2002; Prévosto et al. 2011; Ruskule et al. 2012; Prishchepov et al. 2013; Novoselova et al. 2016; Baeva et al. 2017; Jagodziński et al. 2017; Telesnina et al. 2017; Kalinina et al. 2018; Maslov et al. 2018). Reasons of such striking differences in the undergrowth volume are not well investigated (Prévosto et al. 2011; Ruskule et al. 2012; Novoselova et al. 2016). We propose that grass fires are the most important factors defining the successional trajectory on formerly plowed fields. The lack of research on this topic may be due to the fact that it is not easy to register grass fires, especially in remote fields; their traces can disappear rather quickly and it can be difficult to identify the occurrence of spring grass fires in an area after just several weeks. Another possible reason for the lack of researches on this topic may be that abandoned plowed land without grazing is a rare phenomenon all over the world, whereas it is common in Russia and Eastern Europe. Even so, such abandoned areas are large and their input in the general biogeochemical cycles and regular ecological processes over the world is significant. On the whole, effects of fire on vegetation and the whole ecosystems have been studied in a vast number of works. Usually, fire is considered a natural and inevitable hazard having a fundamental role in sustaining biodiversity and fire-prone ecosystems (Bowman et al. 2009; Moritz et al. 2014; Smith et al. 2016; Prichard et al. 2017). Nevertheless, large gaps of knowledge exist in understanding species-specific responses to fire regimes, in comprehending the spatiotemporal effects on biota at different scales, and in explaining the interactions of fire regimes with ecosystem functions that are related to the structural components of an ecosystem, such as soil, water, atmosphere, and biota (Driscoll et al. 2010; Haslem et al. 2011; Moritz et al. 2014; Kelly et al. 2015; Prichard et al. 2017; Pellegrini et al. 2018). In the Central Russian Upland, grass fires are common, but remain practically non-investigated. Researches on the overgrowing of abandoned lands do not take “the fire aspect” into account (Heikkinen et al. 2014; Baeva et al. 2017; Telesnina et al. 2017; Kalinina et al. 2018), while for other regions, fire risks were found to be positively linked to agricultural abandonment and agricultural landscape fragmentation (Martínez et al. 2009; Zhang et al. 2010a; Pausas and Fernández-Muñoz 2012; Pausas and Keeley 2014; Glagolev and Kogan 2016; Pavleychik 2016). Therefore, the objective of our study was to analyze the overgrowing on abandoned lands in the Central Russian Upland in connection with the grass fire history and to perform this study at the landscape and local scale. At the landscape scale, we analyzed spatial characteristics of the area in relation to the 30-year history of spring fire events which we reconstructed from archival Landsat satellite images. At the local scale, we identified adjacent abandoned fields which had been or had not been affected by fire and we sampled soil and vegetation there. Plant species diversity, soil quality, and relationships between soil and vegetation were assessed for the former fields and for mature forests bordering on the abandoned fields. The study area is located in the middle of the Central Russian Upland of the East European Plain, on the right bank of the Oka River in the Serpukhov district of the Moscow Region. Its total size is about 256.5 km2; and its coordinates are from 54.72 to 54.88° N and from 37.27 to 37.78° E (Fig. 1). The area consists of a moraine-erosion plain of loams on limestone, at an elevation of 150 to 200 masl. Soils are Haplic Luvisols (WRB, World Reference Base for Soil Resources 2006) which show a good internal drainage and textural differentiation within the soil profile A-Bt-C. Luvisols have a higher clay content in the subsoil than in the topsoil, as a result of clay migration leading to an argic subsoil horizon. The local climate is temperate continental; it belongs to the Atlantic-Continental-European climatic region (Alisov 1969; Myachkova 1983). It is moderately warm with a moderate humidity and a rather strong seasonal cycle: with relatively warm summers and moderately cold winters. Long-term observations at the nearest Weather Station (village Danki, coordinates 54.90° N and 37.57° E) during the period from 1973 to 2015 show that the average annual air temperature was + 5.2 °C and the average annual precipitation 673 mm (Baeva et al. 2017); the average January temperature was − 8 °C and the average July temperature + 18 °С over the same period. Evaporation rates are relatively low, which is characteristic for the generally humid climate in this region. The study area is located in the nemoral forest region (Smirnova et al. 2017). This means that the potential vegetation on watersheds is broad-leaved forests dominated by the trees littleleaf linden (Tilia cordata), English oak (Quercus robur), Fraxinus excelsior, Acer platanoides, and Wych elm (Ulmus glabra); shade-tolerant shrubs and an undergrowth of shade tolerant trees occur in the understory; nemoral herbs such as Aegopodium podagraria, Pulmonaria obscura, Asarum europaeum, etc. occupy the ground layer. Light-demanding species, including an undergrowth of shade intolerant trees, occur in open habitats that are kept open by large herbivores or by destructive events, such as windthrow, or man’s actions, or fires. Analysis of historical maps and archive data showed that agricultural lands prevailed in the study area during the twentieth century. Cattle breeding were poorly developed in the region and it was mostly stall. At the beginning of the 1990s, a large proportion of agricultural lands was abandoned due to the political-economic crisis in Russia and forest vegetation did begin to recover on these former fields. Such forests are mainly dominated by Betula pendula and B. pubescens, Salix caprea, or rarely Pinus sylvestris. Currently, arable lands account for 16% of the area and abandoned agricultural lands for 39%. Spring grass fires often happened in the region, especially until 2016; in that year, a state law prohibiting the burning of dry grasses on agricultural and abandoned fields was issued. A map of land-use types of the study area, which we developed in 2015 on the basis of topographic maps, high-resolution satellite imagery, and field observations, was used as the base for this analysis (Bobrovsky and Khanina 2015). Aiming to map the history of spring grass fire events in the region, we used a series of the Landsat satellite images for the area from 1985 to 2015 from March to June: from the time of the possible melting of snow in the study area and the emergence of last year’s dried grasses from under the snow, until the time of the final overgrowing of the abandoned fields with new grasses which ignite badly. The contours of the extent of the fires were manually digitized keeping the topology given in the layer with the boundaries of land categories. As a result, a new land type–fire event layer was obtained in the GIS: each polygon contained information on the current type of land-use and on fires in different years (Bobrovsky and Khanina 2018). It should be noted that it is impossible to identify all fire events by the Landsat archive, because only images taken on selective days are available and only images with small cloud covers can be analyzed. For the 30-year period, we could identify the fire history for 15 years: 9 years when fire events were registered and 6 years when fire events were absent in the analyzed images. For spatial analysis, we used the open-source geographic information system QGIS (QGIS Development Team 2018) and a set of thematic map layers (settlements, rivers, roads, and railroads) from the OpenStreetMap® project (https://www.openstreetmap.org/copyright/en). Spatial analysis included several aspects: (1) descriptive geometry of the polygons including shape indexes, (2) distances to objects of interest, and (3) polygon neighbors analysis. All spatial analyses were performed for the land type–fire event layer, in which the polygons were derived from the actual land type category with account of the fire history. The latter was scored as a set of binary variables 1/0 (fire and non-fire) for each year of the 15 years of fire history observations and with a total number of fire events. A Shape Index was calculated as Perimeter / (2 × √(Perimeter × Area)), that indicates how strongly a particular polygon differs from a perfect circle. Distances to roads of different types including a railroad, to rivers including the Oka River, to lakes, and to settlements were calculated using the GRASS module v.distance, which is a part of QGIS. Nearest Neighbor Index was calculated and tested by the method of Clark and Evans (1954) which is realized in the QGIS “Nearest neighbor” tool for a point layer (centroids of the polygons were used). The number of neighboring burnt and unburnt polygons was also defined for each polygon using the QGIS “Sum line lengths” tool. Aiming to estimate the characteristics of fire events at the landscape scale, we analyzed (1) the fire frequency in relation with the current land type categories, (2) the spatial distribution of the spring fires, and (3) the spatiotemporal clusters of polygons affected by fire. To construct the clusters, we used a density-based clustering algorithm OPTICS (Ankerst et al. 1999) implemented in V-Analytics (aka Common-GIS) software (Andrienko et al. 2013): burnt polygons were combined in the clusters if they had three or more neighbors in a radius of 300 m, which would also burn in the considered or neighboring years (with a difference of 1 year); clusters consisting of less than ten polygons were discarded. 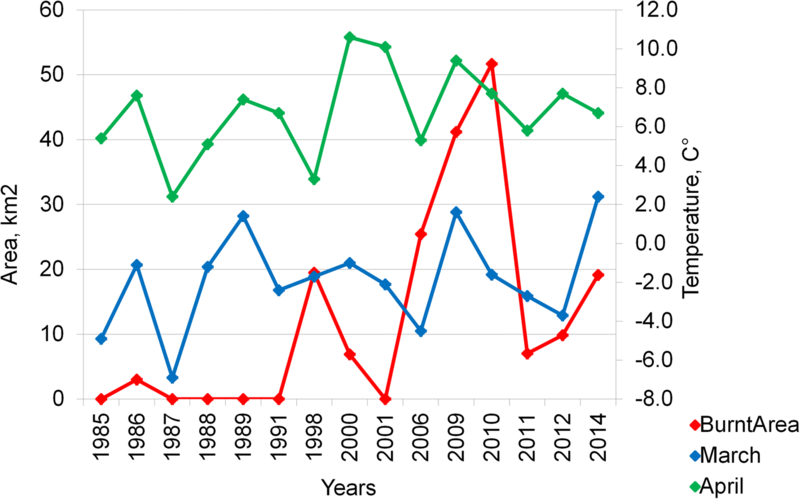 To assess the relationship between climate and fire frequency, we selected years when fire occurrences were observed: 9 years in the period from 1985 to 2014. Then we calculated the Pearson correlation coefficient between the total area (log-transformed) of fires and climatic variables: mean temperatures and sums (log-transformed) of precipitation for spring months. Observations in the Weather Station Danki (see above) were used. Finally, aiming to identify the explanatory variables that most likely affect fire events, we built a binomial logistic regression model using information on fire occurrences for all vegetation patches (excluding the categories “Settlement,” “Water bodies,” and “Others”). The response in the model was fire incidences (0 or 1, for the total period of observations); predictors were a land type category, the presence of settlements, roads, small rivers in a zone of 300 m around a polygon, the logarithm of the polygon area, and the ratio of the number of burnt neighboring polygons to the number of total neighboring polygons. The land type “Forest” seems to be the least fire-affected, therefore this land type was taken as a reference level for the treatment contrast in the regression. The model fit was checked by the le Cessie-van Houwelingen-Copas-Hosmer global goodness-of-fit test and McFadden pseudo R2; the glm function of the R environment (R Development Core Team 2018) was used. At the local scale, aiming to test the hypothesis that successional recovery of vegetation and soil on abandoned arable lands depends on fire events, we had to find such sites for sampling that would meet several criteria: these sites had to be abandoned at the turn of the 1980s and 1990s and only some parts of these sites had to be affected by fire; it was also desirable that these sites would be located close to patches of mature forests in order to avoid hazards in limitations of seed flows of forest species. On the basis of the investigated Landsat archive and land type maps of the study area (Fig. 1), we found that it was extremely rare when fires did not affect abandoned fields or did not spread over the entire abandoned areas. We specially looked for unaffected areas by fire among abandoned lands with a high density and homogeneous structure of woody vegetation (i.e., among land type Al1), because we earlier showed that such a structure of woody vegetation correlates well with the absence of fires during the regrowth (Bobrovsky and Khanina 2018). As a result, we could find only a few sites in the area which were only partly affected by fire. Two such sites, with the conventional names Kargashino and Agarino (site 1 and site 2 hereafter), were selected for soil and vegetation sampling (Figs. 2 and 3). To measure fire effects on soil and vegetation characteristics and to compare these characteristics in abandoned lands and in patches of mature forests, three biotopes within each site were studied: BAA, burnt abandoned arable; UAA, unburnt abandoned arable; and MF, mature forest. According to the analysis of the Landsat archive and high-resolution images (Figs. 2 and 3), we could assert that (1) BAA and UAA were agricultural lands in 1989 and 1991, (2) they bordered mature forest patches, and (3) BAAs were affected by fire at least in 2009 and 2014. Vegetation was sampled at square plots of 10 × 10 m randomly placed within each of the biotopes at two sites using three plots in mature forests and five plots each on the abandoned fields affected and unaffected by fire. A total of 26 plots were sampled at 2 sites (Fig. 3). Vascular plant species in the plots were listed and their percentage cover were visually estimated for the main vegetation layers: the overstory (tree canopy layer), the understory layer including tree undergrowth and tall shrubs, and the field layer comprising the herbaceous species and dwarf shrubs together with low shrubs, tree, and shrub seedlings. The vegetation was sampled in July 2015 when most of the species were well developed in the study area. Nomenclature followed the Russian checklist of wild species (Cherepanov 1995). Soil sampling was done in horizon A which generally is 20 to 25 cm thick. Sampling was done in September 2015 at the same plots where the vegetation was sampled. Three mixed soil samples were taken by the envelope method at a depth of 10 cm in the each of the 3 biotopes of the 2 sites; a total of 18 plots were sampled. Soil samples were air-dried and sieved through 0.25, 1, and 2 mm sieves in the Center of Common Facilities of IPCBPSS RAS. The following chemical parameters were determined: soil pH(KCl) and pH(H2O) values, content (%) of organic and total carbon, total nitrogen and total hydrogen, phosphorus (P2O5) and potassium (K2O5) concentrations (mg kg−1), and exchangeable cation (Ca2+, K+, Mg2+, and Na+) concentrations (cmol kg−1) in the soil samples. The pH(KCl) value was determined in a 1:2.5 soil–1 M KCl solution and the pH(H2O) value was measured in a 1:2.5 soil–water slurry with a Sartorius Basic pH Meter PB-11. Soil organic carbon (SOC) was measured by the titrimetric version of Tyurin’s method (potassium dichromate volumetric method; Vorobyeva 2006) with oxidation in a thermostat at t = 140 °C. Total carbon (C), nitrogen (N), and hydrogen (H) content (%) were measured using an automated Leco CHNS analyzer. Available phosphorous and potassium were estimated by the Kirsanov’s extraction method (Vorobyeva 2006) by treating a 1:5 soil–0.2 M HCl solution and the subsequent determination of phosphorus using a spectrophotometer (UNICO-1200) with ascorbic acid; available potassium was estimated using a flame photometer (BWB-XP Perfomance Plus). Exchangeable cations were extracted by a 1 M ammonium acetate solution and their concentration was determined for Ca2+ and Mg2+ with the complexometric method and for K+ and Na+ with a flame photometric method. To determine soil texture (sand, clay, and silt content, %), samples were treated with sodium pyrophosphate; fractions finer than 0.05 mm were determined by pipette analysis (Shein and Korpachevsky 2007). Fractions larger than 0.05 were classified as sand, those from 0.001 to 0.05 mm were classified as silt, and those finer than 0.001 mm were classified as clay. Statistical analysis was performed in the R statistical programming environment (R Development Core Team 2018) with packages (besides the standard ones), mentioned below. Overall differences in soil variables between the sites and the biotopes were assessed by one-way ANOVAs for each variable and p values of the analyses were adjusted for multiple testing. The more detailed analysis was conducted by means of v tests (Husson et al. 2017), also for each variable. The v test can be considered as “standardized” deviation between the mean of a category (a site or a biotope in our case) and the overall average of a variable and in that way the test examines whether a variable does characterize a category or not. The test statistics is normally distributed under the null hypothesis. 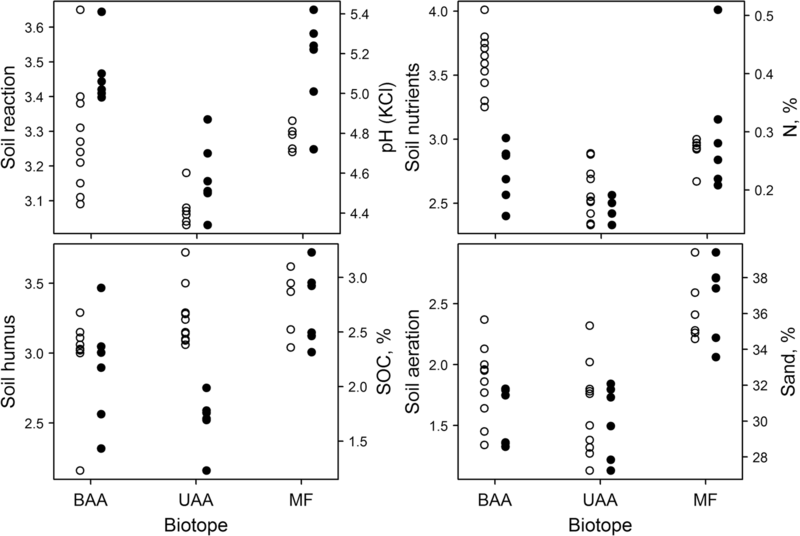 This analysis allowed us finding out what soil characteristics and what values of the soil characteristics are typical for a site or a biotope. The v tests were calculated by the function catdes of the FactoMineR package (Le et al. 2008). To detect any fire effect on vegetation in abandoned fields, we calculated the species richness for sites and biotopes based on species composition data. To analyze variations in the vegetation, ordination analysis of vegetation plots was conducted on species cover in the field layer: we performed the non-metric multidimensional scaling (NMDS) using the metaMDS function of the vegan package (Oksanen et al. 2018) with the Bray-Curtis distance measure. To interpret the ordination axes, correlation vectors with the environmental characteristics of the plots were built using the envfit function of the vegan package. Landolt’s indicator species values (Landolt et al. 2010) weighted by species cover and averaged for relevés were used as the environmental characteristics of the plots. For the each biotope, Landolt’s scores were analyzed and soil scores were then compared with the corresponding measured soil parameters. To assess and visualize the relationship between the soil variables and vegetation, canonical ordination of vegetation plots was performed by a distance-based redundancy analysis (dbRDA, functions capscale and dbrda of the vegan package). Its axes are linear combinations of the soil explanatory variables that best explained variation in plant species composition. The analysis revealed how distant the burnt and unburnt abandoned fields and mature forest plant communities are from each other and what soil variables define these distances. Species indicator values sensu Dufrêne and Legendre (1997) were calculated with the multipatt function of the indicspecies package (De Cáceres and Legendre 2009). We add significant indicator species for the biotopes to the ordination diagram. Mature forests dominated by Populus tremula, Betula pendula, B. pubescens, rarer Quercus robur or Tilia cordata, sometimes Pinus sylvestris or Picea abies cover 21.5% of the study area: it is the “Forests” land type category in Table 1. Tree crowns usually cover from 60 to 80% of the overstory in this land type, while patches where crowns cover no more than 30% of the overstory were classified as “Sparse forests” (0.8% of the area). We marked out these land type categories because we assumed that they might show different responses to fires and because they are diverse in the composition of their ground vegetation layer: dominating by either forest or meadow plants. “Forests” patches have highest values of mean area and mean perimeters compared to all other land types and diverge from circles to a greater extent than others (except meadows which are the most elongated) (Table 1, Fig. 1). As a whole, meadows occupy 6.3% of the study area and are located either along valleys of streams and rivers, including the Oka River, or outside river valleys. The largest proportion of the study area is occupied by abandoned agricultural lands (mainly former arable land): in total, it accounts for 39% of the area. Abandoned lands vary greatly in coverage of woody vegetation: from highest coverage with a uniform tree cover to the absence of trees or the presence of single specimens. In all cases, the pioneer tree species Betula pendula, B. pubescens, Salix caprea, or Pinus sylvestris occur there. Only 1% of the abandoned lands carry a homogeneous dense tree growth (Al1 hereafter). This land type category occupies only 0.4% of the study area and distances between the neighboring polygons carrying this type are greatest (Fig. 1, Table 1). Abandoned lands with a spot-wise distribution of tree growth (Al2 hereafter), with a tree coverage of small density (Al3), and without trees or with single trees only (Al4) occupy 10, 17, and 72% of the abandoned lands, respectively. In this sequence, their number of polygons, their mean areas and perimeters slightly increase, though the increase has a higher significance for polygons in the layer of land type calculated without fire history in the study area (colored areas without internal lines in Fig. 1). Current agricultural lands (mainly arable) and settlements occupy 16 and 15% of the study area, respectively. Mean areas, perimeters, and median shape indexes are similar for these land types, but the mean area of “Arable lands” polygons calculated without fire history is the largest: it accounts to 1.05 ± 0.31 km2 with a maximum area of 8 km2. The eightfold decrease in the average area of arable lands is a consequence of the high fire frequency on these lands, which probably have been abandoned from time to time since 1985. All land types, except Al1, showed statistically significant spatial aggregations of the polygons. 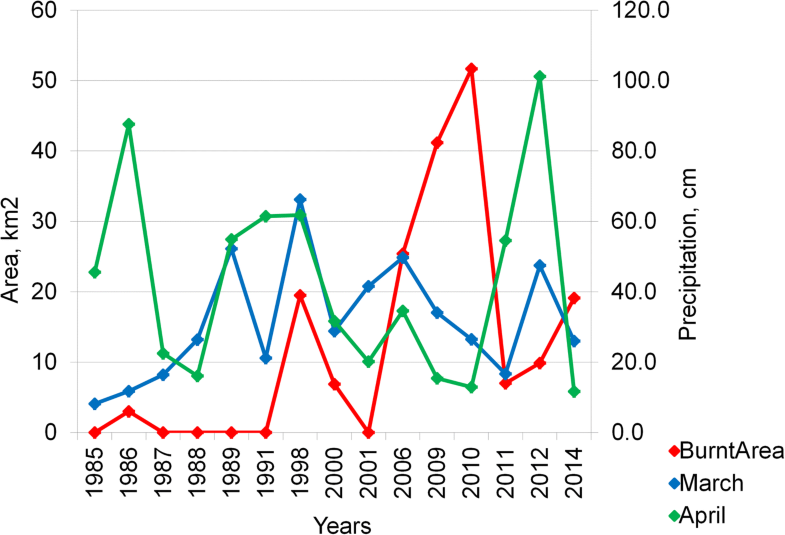 Based on the analysis of archival Landsat images, we concluded that from 1985 to 2015 spring grass fires affected in total not less than 42% of the study area (Fig. 4), fire events mainly occurred from 1998 to 2014. Most parts of this area burnt only in 1 or 2 years, while 19% burnt in 3 or 4 years, and only 2% in 5 or more years. In general, neighboring sites with different frequencies of fires formed large contours, in which frequently burnt areas occurred adjacent to rarely burnt areas. All spatiotemporal clusters of the burnt polygons bordered on settlements or roads including a railroad and a highway (Fig. 5); furthermore, some clusters were located at the edge of the study area. The latter can be explained by the high frequency of spring fires in the neighboring Tula region where we observed spring fires practically in all years for which we could find archival Landsat data. Among land type categories, generally 71.8% of the abandoned lands were affected by fire. Abandoned lands without trees or with single trees (Al4) were most fire-affected: fire events were observed in 77.5% of their area (Fig. 6). 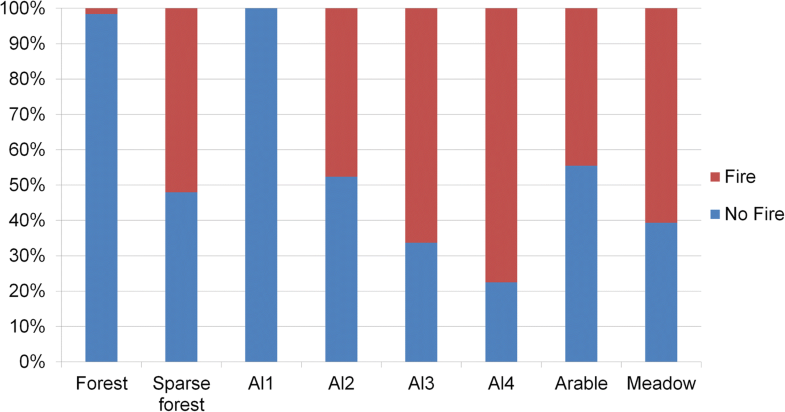 The proportion of fire-affected lands decreased along the sequence Al4-Al3-Al2 (77.5–66.3–47.6%) and fire was not observed in lands with a homogeneous structure of tree growth (Al1). Only 1.6% of the land type “Forests” was fire-affected, while half of the areas of “Sparse forests” as well as meadows burnt at least one time or more. The proportion of fire-affected area was also high (48%) in agricultural lands (“Arable lands”) which might have been abandoned in the past and subsequently been plowed again. Mean temperatures and the sums of precipitation in the spring months fluctuated in the observed years. Most of the Landsat images with fires were taken in April or during the first days of May (when there are national holidays in Russia and it is tradition to spend these days outside home, in nature) and practically all images without fires were taken during the second half of May. Therefore, the climatic parameters for March and April turned out to be the most important in connection with the spring fire hazard (Figs. 7 and 8). For the years in which we observed fires, we found a high significant correlation (− 0.7) between the total area covered by fires and the sum of April precipitations. There was also a rather high, but not significant correlation of the fire-affected area with mean March temperatures. Generally, we can conclude that the area of spring fires increases under conditions of high temperatures in March and low sums of precipitation in April. The binomial logistic regression model explained well the fire occurrences (Table 2). Presence of roads and small rivers in the surroundings did not change the fire odds, while the presence of settlements was a rather important factor. Fire odds increased with an extension of polygon area and with a growth in the number of burnt polygons in the surroundings. Fire odds also depended on land type categories: they were highest for the “Arable lands” and gradually declined along the sequence Al4 to Al2; they were also rather high in meadows and sparse forests. Plant communities located in similar biotopes at two investigated sites were rather similar to each other: (1) burnt abandoned arable lands (BAA) were represented by grassy communities dominated by Calamagrostis epigeios, sometimes with spots of Angelica sylvestris and Urtica dioica; (2) unburnt abandoned arable lands (UAA) were overgrown by young 25-year-old forest consisting of pioneer tree species with a high level of crown cover; and (3) 75-year-old forests grew in patches of mature forests (MF). The analysis of soil characteristics at both sites showed that only the Ca2+ values were significantly different between the two sites: mean values were 28.0 ± 3.1 and 33.3 ± 5.6 cmol kg−1 in sites 1 and 2, respectively. At that, practically all chemical soil variables (except pH(H2O), Na+, and Mg2+) were statistically different in the studied biotopes (Table 3). In the young forests growing on unburnt abandoned arable land, the soil was the most acidic, and had the lowest values of carbon, nitrogen, Ca2+, and hydrogen. The soil in the burnt abandoned arable land had the lowest value of C/N, but the highest values of P2O5, K2O5, Ca2+, and K+. The soil in the mature forest patches was characterized by maximum nitrogen, carbon, C/N, and hydrogen values; the highest pH values; and lowest content of phosphorus. The percentage of sand was also highest in the soil of mature forests. A total of 160 vascular plant taxa belonging to 45 families were identified in the plots. We observed 134 and 119 vascular plant species in site 1 and site 2, respectively; the Jaccard similarity between the sites was 20.0 and it ranged from 25.8 to 40.8 between the similar biotopes of these two sites. Mean within-site Jaccard similarities were 22.1 in site 1 and 26.3 in site 2. Young forests that had developed on the unburnt abandoned lands for 25 years (UAA) were the most diverse: it contained 110 species including 11 tree and 7 shrub species (38.8 ± 6.0 species per 100 m2). Betula pendula and Salix caprea dominated in the overstory with a participation of Populus tremula. Acer platanoides, Tilia cordata, and rarer Quercus robur and Fraxinus excelsior occurred in the undergrowth. The nemoral Geum urbanum and the boreal Solidago virgaurea sometimes dominated in the ground layer. Species of forest and open habitats, such as Fragaria vesca, Poa palustris, Hypericum perforatum, Festuca gigantea, Epilobium montanum, Dryopteris carthusiana, Chamaenerion angustifolium, Calamagrostis epigeios, Pyrola rotundifolia, Taraxacum officinale, Urtica dioica, Veronica chamaedrys, etc. often occurred. Grassy communities growing in burnt abandoned lands (BAA) were also diverse: they contained 100 species including 7 tree and 1 shrub species, which occurred in the ground layer of the vegetation; the mean number of vascular plants per 100 m2 was 34.4 ± 4.0. Light-demanding species of open habitats with various requirements of soil nutrients and soil reaction, such as Calamagrostis epigeios, Chamaenerion angustifolium, Cirsium arvense, Anthriscus sylvestris, Artemisia vulgaris, Angelica sylvestris, Achillea millefolium, Convolvulus arvensis, Dactylis glomerata, Equisetum arvense, Festuca pratensis, Heracleum sibiricum, Hypericum perforatum, Leucanthemum vulgare, Linaria vulgaris, Oberna behen, Potentilla argentea, Stachys palustris, Tanacetum vulgare, Taraxacum officinale, Veronica longifolia, Vicia cracca, V. hirsuta, and Urtica dioica often occur. Patches of mature forests were the least diverse: they contained 39 vascular plant species including 6 tree and 6 shrub species (20.2 ± 3.7 species per 100 m2). The overstory was dominated by Populus tremula and Betula pendula with a participation of Quercus robur, Tilia cordata, and Acer platanoides. Corylus avellana, Lonicera xylosteum, and Padus avium often occur in the understory. The nemoral species of broad-leaved forests Pulmonaria obscura and Galeobdolon luteum dominated in the ground layer; Asarum europaeum and Ranunculus cassubicus were often found. 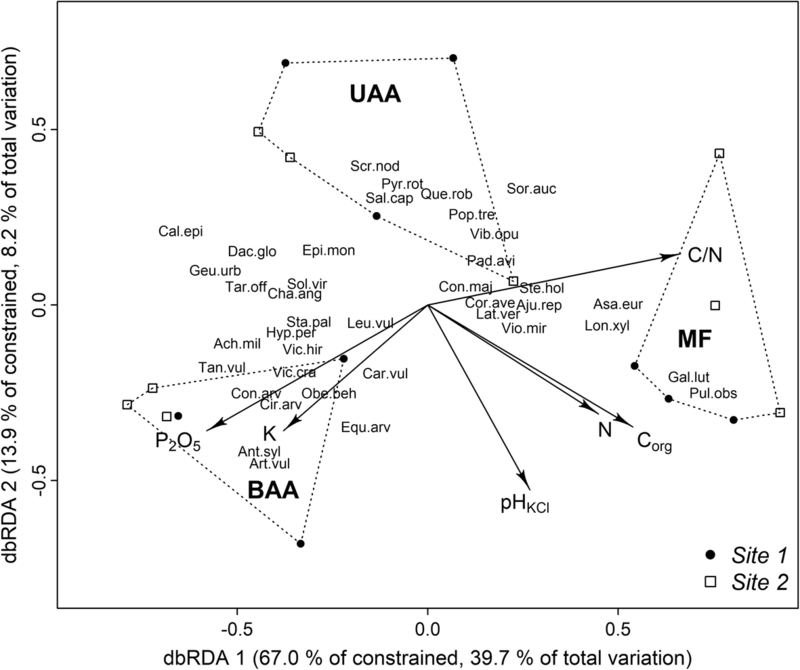 All the studied biotopes were differentiated well in the ordination space (Fig. 9). The first two NMDS axes represented 68% of data variation. The first axis corresponded to the complex biotic gradient from the grassy to the mature forest community. As regards the Landolt’s environmental characteristics, the first axis had the strongest correlations with light availability (r = − 0.77) and nutrients (r = − 0.47). The second axis had the strongest correlations with soil moisture (r = 0.49). 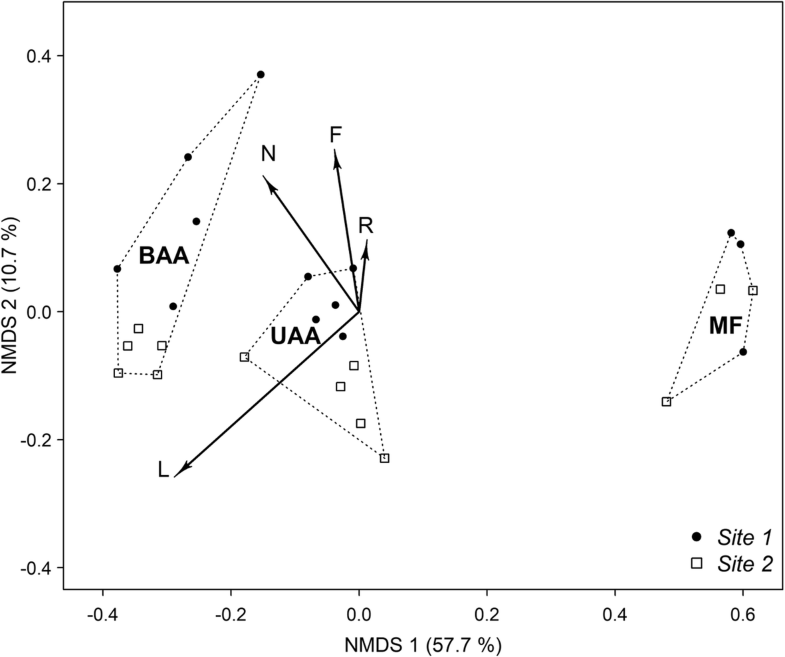 Note that in the biotopes BAA and UAA, plots from sites 1 and 2 differed along the second ordination axis and this was more clearly so for the grassy communities, but the variation along the first axis was strongest (57.7%). The Landolt’s scores calculated by plant species indicator values were in good agreement with the measured soil characteristics (Fig. 10), but some features can be noted. Landolt’s scores of soil nutrients had the highest values in grassy communities due to the fact that the value “characterizes the nutrient content in the soil, referring mostly to nitrogen and often also to phosphorous” (p. 339 in Landolt et al. 2010) and the highest P2O5 values were observed in the BAA biotope (mean value 13.1 ± 1.5 mg kg−1). 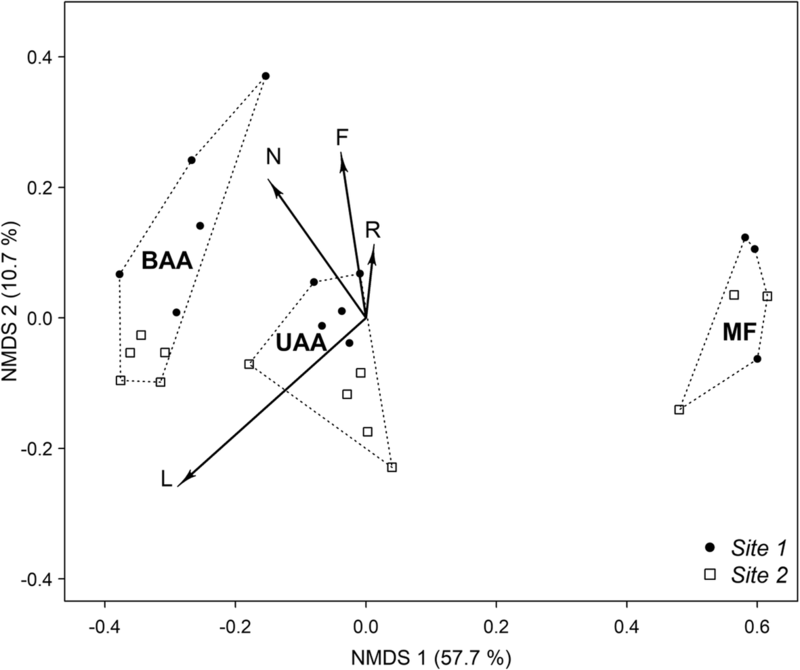 The Landolt’s scores of soil humus and the SOC values showed similar relative changes between the biotopes except for UAA: measured values were lowest in this biotope while the Landolt’s scores were relatively high due to forest species which often have high Landolt’s soil humus values. Results of dbRDA showed that the species composition was best explained by the following six soil variables: carbon to nitrogen ratio, phosphorus concentration (P2O5), soil reaction, contents of organic carbon and total nitrogen, and exchangeable potassium cation concentration (Fig. 11). The strongest correlations with the first canonical axis (which was significant and explained about 40% of the total plant species variation) were shown by the C/N and P2O5 values (biplot scores 0.80 and − 0.70, respectively) and their vectors pointed oppositely: to the biotopes of mature forest and grassy communities growing on burnt abandoned arable land. Besides phosphorus concentration, the vector of potassium was also directed to the BAA biotope (biplot scores for K+ were − 0.45 and − 0.65 for the first and second axes). The strongest correlation with the second axis had pH(KCl) values (biplot score − 0.94) whose vector pointed away from the young forest (UAA biotope). Contents of organic carbon and total nitrogen had high correlations with the first and second canonical axes: biplot scores 0.65 and − 0.62 for SOC and 0.54 and − 0.55 for N; their vectors also pointed away from the UAA biotope with a deviation towards the MF biotope. Typical nemoral herbs, such as Asarum europaeum, Galeobdolon luteum, Pulmonaria obscura, and the shrub Lonicera xylosteum showed maximal indicator values in the MF biotope (Fig. 11). In the UAA biotope, the most characteristic species were the forest herbs Pyrola rotundifolia and Scrophularia nodosa and various tree and shrub species, such as Populus tremula, Quercus robur, Salix caprea, Sorbus aucuparia, Padus avium, Corylus avellana, and Viburnum opulus, which grew in the ground layer of young forests developing on unburnt abandoned lands. Species of open habitats (often weeds) with different demands of soil fertility, such as Artemisia vulgaris, Anthriscus sylvestris, Cirsium arvense, Convolvulus arvensis, Oberna behen, Tanacetum vulgare, Vicia cracca, etc. were characteristic species of burnt abandoned lands. In first part of our study, at the landscape scale, we analyzed spatial characteristics of the 256.5 km2 area in relation to its 30-year history of spring fire events with special attention for abandoned arable lands. They occupy 39% of the area. We discovered that the largest burnt areas are located within abandoned agricultural lands without trees or with single trees (Al4): 77.5% of their area was fire-affected. Abandoned lands covered by young Betula spp. or Salix caprea forest with a homogeneous structure of the tree layer (Al1) were not at all burnt. Results of the regression analysis revealed significant factors explaining fire occurrences: land type category, presence of settlements, burnt surroundings, and the patch size. All this findings together with the correlations between climatic variables and fire-affected areas allowed us to conclude the following. In the study area, the occurrence of grass ignition is accidental and depends on man, but the area of fire spread is essentially determined by climatic parameters and the presence of inflammable material, i.e., dry grass. High March temperatures cause a rapid snowmelt and then a low sum of precipitation in April increases the inflammability of the abundant dry grasses on the former fields: the less the density of the tree layer, the higher the abundance of grass and the quantity of inflammable material. Similar results were obtained in studies on savanna–grassland communities in Africa and south-central Brazil: tree cover was found to be one of the main factors limiting fire there and the predominance of grassy fuel was the primary cause of the high inflammability of these communities (Archibald et al. 2009; Hoffmann et al. 2012; Baudena et al. 2015). 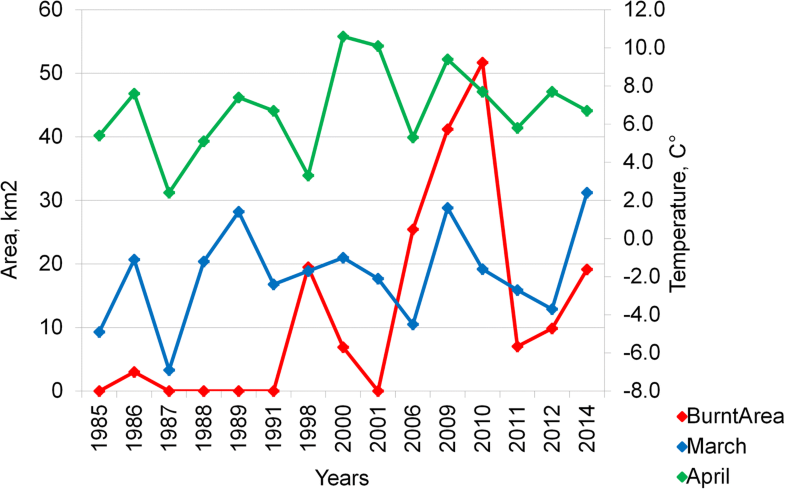 A strong association of wildfire risk with an earlier spring snowmelt, and increasing spring and summer temperatures, was also shown for mid-elevation Northern Rockies forests (USA) (Westerling et al. 2006), where grassy inflammable material may be scarce, but the ignition process is similarly related to climatic parameters. Prichard et al. (2017) showed for several fire-prone ecosystems that fire odds are higher in places burnt before. For the Mediterranean region, Moreria et al. (2011) concluded that with increase of fire frequency, homogeneous landscapes covered by fire-prone vegetation are formed. Our results indirectly confirmed these findings: in our area, fire odds increased along the series A12-A13-A14, and in that sequence also the area of burning and the frequency of fires increased; fire odds also increased with the extent of the patch size (log transformed) and the increase in the number of burnt patches in the surroundings. Human-induced fire risk is usually checked by the distances to human infrastructure, such as roads, buildings, villages, and others. Chang et al. (2013) and Zhang et al. (2010b) reported that distances to roads and settlements in combination with suitable meteorological conditions (and with vegetation types in the first work) were the main driving factors of fires in two provinces in China. Human factors associated to high wildfire risk were found to be linked to agricultural landscape fragmentation, agricultural abandonment, and development processes in Spain (Martínez et al. 2009). At that, Knorr et al. (2014) showed that increasing population density can reduce fire frequency. It was found that only for areas of up to 0.1 people per km2, fire frequency increases by 10 to 20% compared to uninhabited areas. A similar result was obtained by Andela et al. (2017): the authors showed that over the past 18 years, the globally burnt area declined by 25% and the decrease has been largest in savannas and grasslands because of the agricultural expansion and intensification there. In our study, the presence of settlements was a rather important factor that increased the fire odds, while all spatial-temporal clusters of burnt patches occurred adjacent to settlements or roads. On the whole, at the landscape scale, our results mainly confirmed the results of the analysis of fire events and fire risks and their relationship with land and climate parameters obtained earlier. However, our results are the first for the Central Russian Upland to reveal the relationships between fire events and issues of vegetation recovering on abandoned agricultural lands. Based on these results, we propose a scheme emphasizing the dependence of the succession trajectory in abandoned arable lands on the fire mode (Fig. 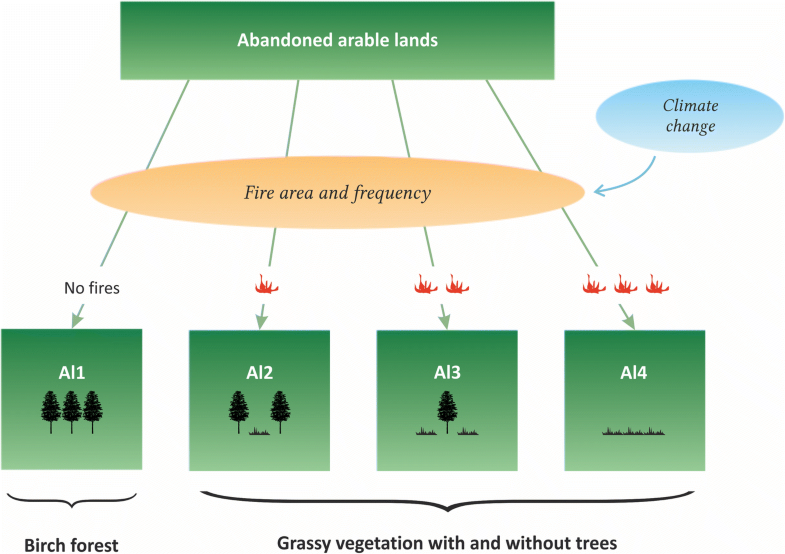 12): abandoned arable lands change into forest with pioneer tree species with a high level of the crown coverage in a case of fire absence; the extent and frequency of fire on abandonment lands define their transit into grassy vegetation with the tree growth inversely proportional to fire event parameters. In the second part of our study, we analyzed the soil and vegetation in the biotopes formed in the abandoned arable lands in extreme positions of the succession scheme: in grassy communities and in young birch forests that developed with or without fire in 25 years following the abandonment of the land. Our results showed that young Betula pendula forests have the highest diversity of vascular plant species due to the presence of both shade-tolerant and shade-intolerant species, while practical all chemical variables of the soil are at the lowest. This confirms earlier obtained results on the loss of the ecosystem’s carbon and nitrogen with woody plant invasion (Jackson et al. 2002) as well as the significant decrease of SOC, N, P, and K together with the increase of soil acidity during first 10 years of forest recovery on abandoned lands in Luvisols of the forest-steppe region of Russia (Tokavchuk 2010). This may be explained by the fact that the highest consumption of nutrients by the woody vegetation occurs during the first decades of growth (Lebedev 2013a, 2013b) and also by the fact that of the total aboveground biomass of 10-year Betula pendula individuals, the proportion of leaves is lowest (7–10%), and it is those that annually supply the nutrients to the soil (Gulbe 2009). In turn, mature forests show the highest values of carbon, nitrogen, C/N, and pH values, but the lowest values of vascular plant species diversity. This also is consistent with other studies (Bobrovsky 2010; Zhang et al. 2010a; Kukuļs et al. 2015; Nyawira et al. 2016; Arévalo et al. 2017). The grassy vegetation developed on burnt arable lands had the significantly lowest C/N rates with the highest values of P2O5, K2O5, Ca2+, and K+. The highest values of phosphorus and potassium in burnt abandoned arable can be explained by high residual levels of P and K in the former arable soils (Gough and Marrs 1990; Marrs et al. 1991) and high rates of element cycling in communities supported by periodical fires (Rabotnov 1982; Bleken et al. 1997). Decrease in soil carbon and nitrogen values is reported with increase of fire frequency in savanna and broad-leaved forests (Pellegrini et al. 2018) and in Scots pine forests in the hemiboreal and nemoral regions of European Russia (Nadporozhskaya et al. 2018). Reich et al. (2001) also revealed that carbon and nitrogen cycling is tightly coupled across fire frequency and vegetation type gradients: the combination of low fire frequency and high tree dominance leads to high rates of N cycling, while the opposite, high fire frequency and high grass dominance, leads to low rates of N cycling. On the whole, our values of soil and vegetation characteristics fall into the range of values found earlier for abandoned lands in the Moscow Region (Baeva et al. 2017; Telesnina et al. 2017; Kalinina et al. 2018), but our study specifies the regional scores by accounting for external impacts (grass fires) after land abandonment. This, our findings at the local scale of the study generally, confirm the results of other studies performed both in abandoned agricultural lands and in fire-affected areas and they specify concrete ecological processes occurring during successional recovery on abandoned arable lands under different external conditions. We strongly support the appeal of Driscoll et al. (2010) that, aiming to improve our knowledge on fire effects in ecosystems, a more comprehensive and sophisticated approach to fire research (including natural experiments with a careful choice of the study area) should be applied than has been done so far. Our results showed the key role of grass fires in the formation of differences in soil and vegetation during the successional recovery of abandoned lands at the local and landscape scales. They also improve the methods for assessing the landscape mosaics of abandoned lands and can help to identify areas to which expedient management efforts can be applied aiming to harmonize biodiversity conservation and land-use demands. Fields invaded by trees and shrubs tend to remain abandoned (Utkin et al. 2002, 2005); this may lead to subsequent forest succession, due to the high costs of converting such fields back to agriculture (Larsson and Nilsson 2005). Alternatively, different values of forest may play an important role: besides the value of wood, rewilding abandoned landscapes may provide important benefits for forest biodiversity and forest ecosystem services, such as carbon sequestration, soil protection, nutrient cycling, water regulation and supply, etc. (Chazdon 2008; Navarro and Pereira 2015). Positive experiences of such ecosystem management occur in Eastern Europe where agricultural land-use clusters are developed in favorable areas while marginal lands revert to forest (Griffiths et al. 2013). It is a necessity to carry out an ecosystem-based management of former agricultural lands because land abandonment has been shown to be the most prominent among multiple proximate drivers of landscape change (Foley et al. 2005; Plieninger et al. 2016). We thank Mikhael Shovkun and former employees of the land-use department of the Serpukhov district administration for historical land-use maps of the study area; Sergey Bykhovets for consultations on climatic characteristics of the study area; Natalia Ivanova and Maxim Shashkov for sampling vegetation and soil data; Anna Khodzhaeva for consultations on soil analysis; and Natalia Andrienko and Gennadiy Andrienko from the Fraunhofer Institute IAIS and City University London for their help in the application of V-Analytics. We thank Prof. Marinus Werger for his assistance in language editing. This study was partly supported by the Russian Foundation for Basic Research and the Government of the Moscow region, project no. 17-44-500297. Our geobotanical data are stored in the European Vegetation Archive, EVA (sPLOT) as a part of the database Temperate Forests of European Russia (ref. number EU-RU-014) (https://www.givd.info/ID/EU-RU-014). LK has contributed in designing the study, analysis of data, writing and reviewing of the manuscript. VS has contributed in statistical analysis of data and writing the manuscript. MR provided GIS support and has contributed in writing the manuscript. MB has contributed in the designing of the study, developed of the land-use map, analysis of the archival Landsat data, and reviewing of the manuscript. All authors have contributed in interpretation of the results; they read and approved the final manuscript. Landsat – Glovis (2017) https://glovis.usgs.gov. Accessed 10 Mar 2017. Yandex Maps (2017) https://yandex.ru/maps/. Accessed 10 Mar 2017.